Do you have people in your life that you feel like you’ve known forever, but it’s only been a little while? I do and Leigh Anne from Your Homebased Mom is one of those people. I feel like I’ve known her forever and I haven’t even had the opportunity to meet her in person yet. 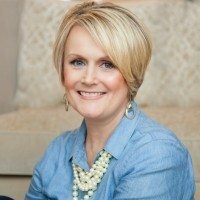 I am so excited to welcome Leigh Anne to share her gorgeous recipes with you. Be sure to check out Cupcakes & Kale Chips for some Healthy Desserts or Love Bakes Good Cakes for some Healthy Meal Ideas for our #EatHealthy15 Series. Hi, I’m Leigh Anne from Your Homebased Mom and I’m excited to be here today. Jenny is a doll and has been such a big help to me in the blogging world. She is always willing to answer my silly questions and share her expertise with me! We love hummus at our house. It is a healthy, low cal, go to snack for my husband when he gets home from work. He is gluten free and dairy free so it is perfect for him. He grabs some carrots or snow peas and dips away. I prefer my hummus with pita bread or tortilla chips (not quite as low cal and not gluten free). 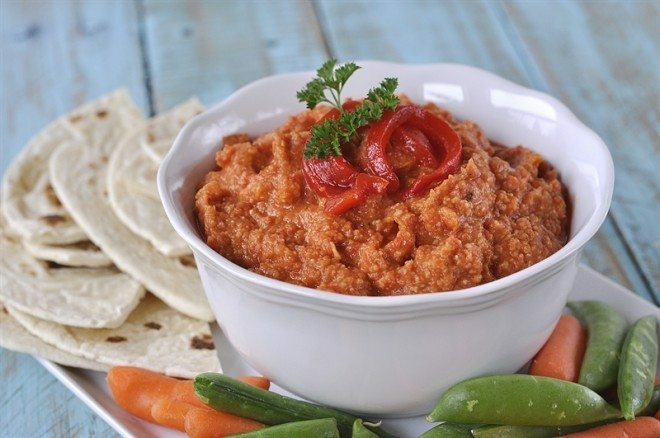 Hummus is traditionally made out of garbanzo beans and tahini which is sesame seed paste. Tahini can be really expensive and you only need a small amount for a batch of hummus so I found an easy and less expensive alternative – sesame oil. It’s basically made out of the same thing, sesame seeds! 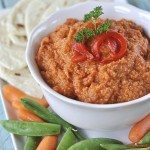 You can find my traditional hummus recipe here. I also have a yummy black bean version here. I love playing with different flavors and textures in my hummus. 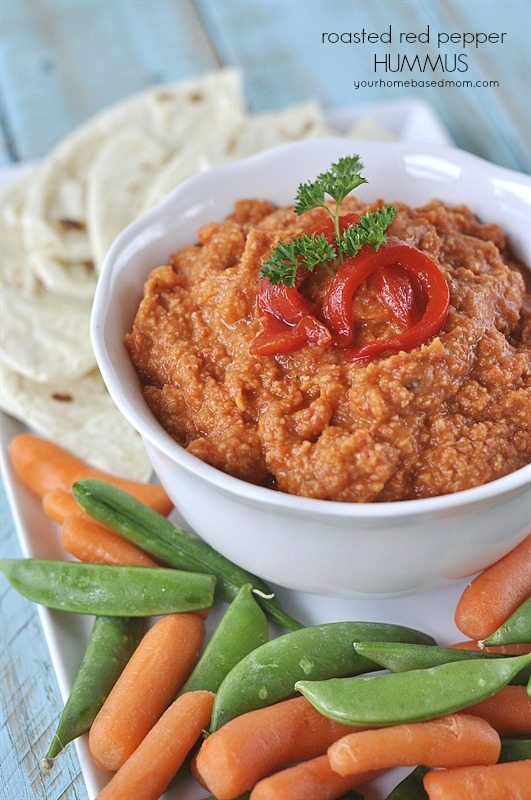 Today I have a roasted red pepper hummus recipe for you. I use canned garbanzo beans to make my hummus and there is a thin skin on the beans. You can leave it on or if you want a smoother texture to your hummus, it is easy to remove the skins. I just put a bunch of garbanzo beans in my hand and rub my hands together. The skins will come right off. But really, I like it just as well when I leave the skins on. I make my hummus in the food processor. Just pop all the ingredients in and give it a few pulses until it reaches the consistency you like and you’re done! It’s easier, cheaper and yummier to make your own hummus at home. 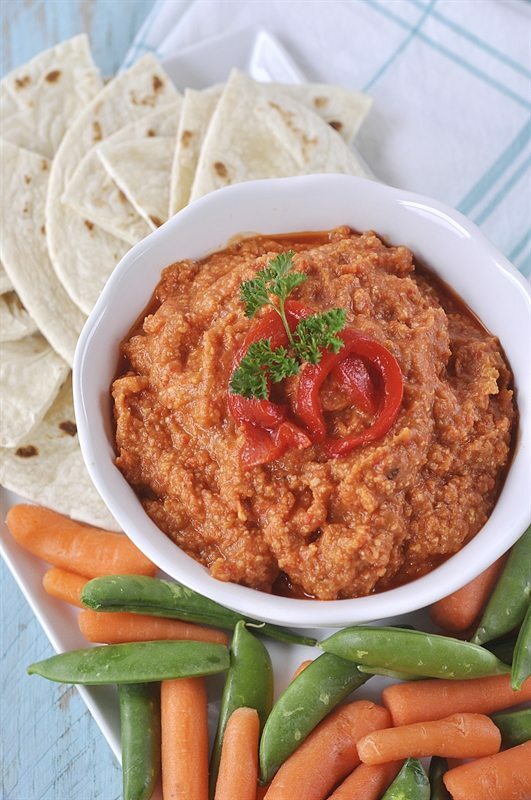 For today’s version of hummus I used some roasted red peppers I had in my pantry (they came in a jar). It is also easy to roast your own red peppers by following my directions here. I also added in a head of roasted garlic. So yummy. If you’ve never roasted a head of garlic before it is easy to do and your house will smell amazing. The other day I was roasting some garlic and a neighbor boy walked into my house and said he wished his house smelled like mine! Just slice off the top of the head so that the cloves are exposed. Drizzle with some olive oil and then wrap up well in foil and put in a 350 degree oven for 30-40 minutes (depending on the size of your garlic head) until the garlic is fragrant and soft. You should be able to squeeze the garlic right out of the skin. 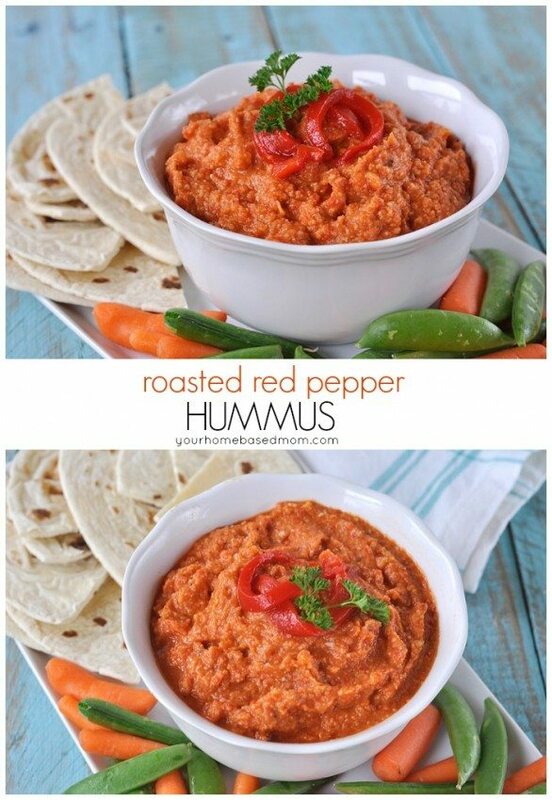 Just garnish your hummus with a bit more roasted red pepper, a little parsley for color and you are good to go. 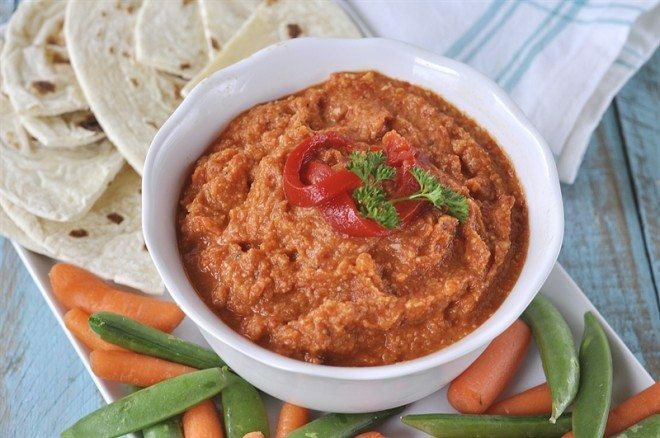 A healthy, yet delicious Roasted Red Pepper Hummus. Add in red pepper and process until desired consistency is reached. I’m Leigh Anne and food, family and friends are three of my favorite things. I am the mother of four young adults, a new mother in law and am still trying to adjust to life as an empty nester along with my husband of over 30 years. I love throwing parties, burying my head in a book and digging in the dirt in my garden. I believe that life is beautiful and it is up to us to find and create that beauty. I love sharing my journey to finding the pretty and delicious in life over at Your Homebased Mom. You can also visit me on Facebook, Pinterest, Twitter, Google+ or Instagram. oooh I’ve been on a hummus kick lately! This will be perfect!